The new Starbucks Japan #STRAWBERRYVERYMUCHFRAPPUCCINO® is a blend of fresh strawberries and cream. The white version comes with an addition of white mocha syrup and blended macarons. 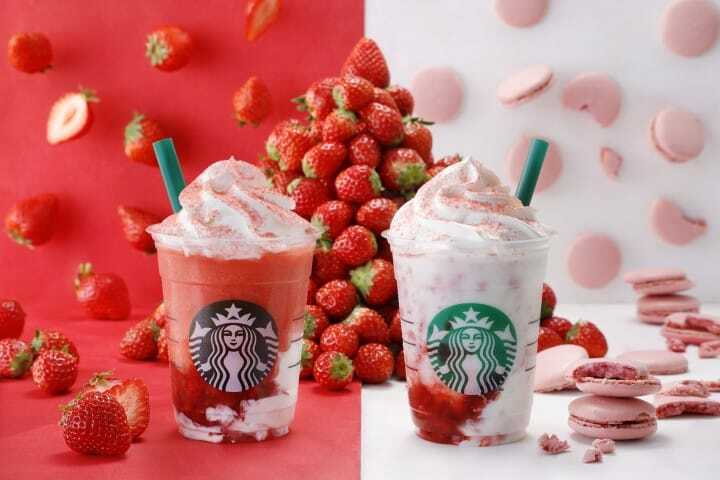 In 2018 Starbucks launched the limited edition #STRAWBERRY VERY MUCH FRAPPUCCINO® together with a limited three-day Starbucks Coffee Strawberry Vinyl House in Daikamaya. It was such a big success that the #STRAWBERRYVERYMUCHFRAPPUCCINO® is back this year. It will be available all throughout Japan and it brought a macaron flavored twin. The #STRAWBERRYVERYMUCHFRAPPUCCINO® 2019 comes in red and white. The #STRAWBERRYVERYMUCHFRAPPUCCINO®__RED (Tall 640 yen) is made with real strawberry puree and powder blended with cream. It gives the feeling of eating real strawberries and cream on a hot summers day. The #STRAWBERRYVERYMUCHFRAPPUCCINO®__WHITE (Tall 640 yen) has added white chocolate mocha syrup and macaron pieces for additional sweetness and crunch. It is the sweeter and creamier one of the two. Both #STRAWBERRYVERYMUCHFRAPPUCCINO® will be available in most Starbucks Japan stores from April 11th until May 15th, 2019. Just as last year there will be a limited edition Starbucks booth. The "Ichigo no Futago Mise" (Strawberry Twins Shop) will be open for just three days between April 10th and April 13th. It will open at 13:00 on April 10th and close as soon as the STRAWBERRYVERYMUCHFRAPPUCCINO® is sold out. Alongside the STRAWBERRYVERYMUCHFRAPPUCCINO®, there will also be a STRAWBERRY MARBLE CAKE LATTE ( 200 yen) available at the convenience store. The rich flavor of coffee and cream is blended with strawberries to evoke the feeling of drinking a cake. It will be available from April 16th, 2019 nationwide.